When the folks at Kikkoman approached me to soy brine a turkey for Thanksgiving, my first inclination was to turn them down. 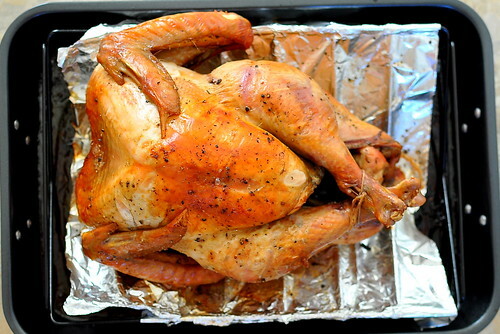 I love turkey and all, but preparing one from scratch seemed rather difficult for a novice poultry cook like myself. My worst case scenario was that the big ‘ol bird would turn out unattractive and dry and that the whole experience would scar me for Thanksgivings to come. 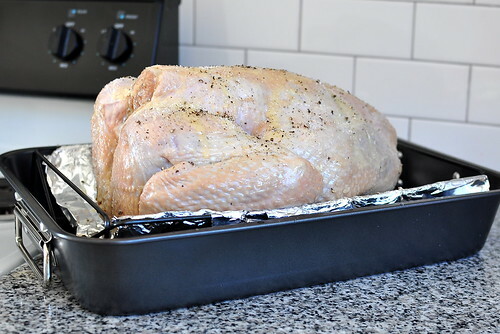 What eventually motivated me to change my mind was exactly what scared me at the start—the challenge of brining and roasting a turkey all by myself. I felt that if I didn’t step up to plate this year, it’d probably be a solid decade before the opportunity would present itself again. I had to do it. For the brining process, I adapted a simple recipe from Kikkoman, and for roasting, I turned to my beloved cooking bible, The America’s Test Kitchen Family Cookbook. Now, that everything’s been prepped, roasted, carved, and eaten, I must say that the process wasn’t as difficult as I had imagined, and the results were definitely stellar. The soy sauce brine made for an all-around juicy bird and imparted a mild savoriness upon the flesh. 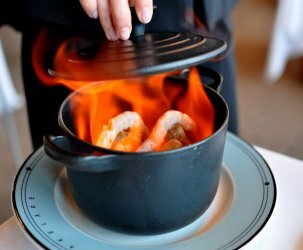 The Test Kitchen’s “flipping” method (details below), yielded an evenly cooked bird with a golden and crispy exterior from top to bottom. Turkeys are notoriously fickle creatures with a penchant for dryness, but thanks to the brine and the Test Kitchen’s tried and true methods, everything turned out just right. 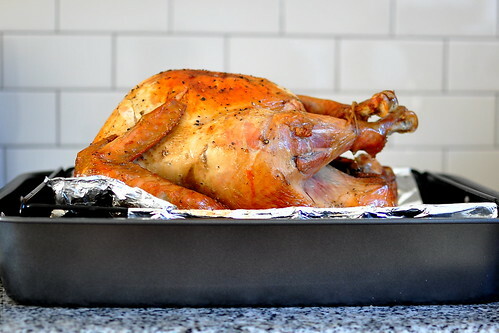 From one first-time turkey roaster to another, you can totally do it! The night before roasting, remove the giblets and turkey neck from the bird. Rinse the turkey inside and out. In a large stock pot, combine all the brine’s ingredients. Stir well, making sure that all of the salt is dissolved. 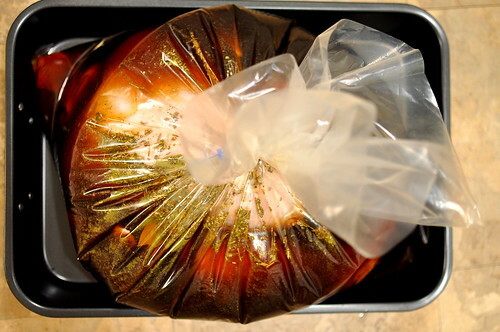 Place the turkey inside a brining bag and pour the brine mixture over the turkey. Adjust an oven rack to the lowest position and heat the oven to 425 degrees. Line a V-rack with aluminum foil and poke several holes in the foil. Set the rack inside the roasting pan and spray the foil with vegetable oil spray. To prepare the turkey for roasting, trim the tail piece, tie the legs together with kitchen twine, and tuck the wings under the bird. Brush the breast-side of the turkey with half of the butter, then season with salt and pepper. Lay the turkey in the rack breast-side down. Brush the back of the turkey with the remaining butter, then season with salt and pepper. Roast the turkey for 1 hour. Remove the turkey from the oven. Lower the temperature to 325 degrees. Tip the juice from the cavity of the turkey into the pan. Flip the turkey breast-side up using clean potholders or kitchen towels. Continue to roast the turkey until the thigh registers 175 degrees on an instant-read thermometer, 1 to 2 1/2 hours longer. 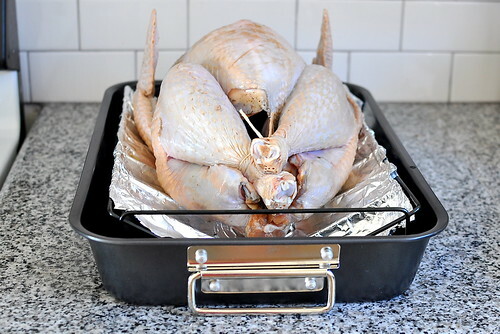 Add water or chicken broth to the roasting pan as needed to prevent the drippings from burning. Bravo! You got some great color on that bird too! Super duper gorgeous. I want to tear that bird up. 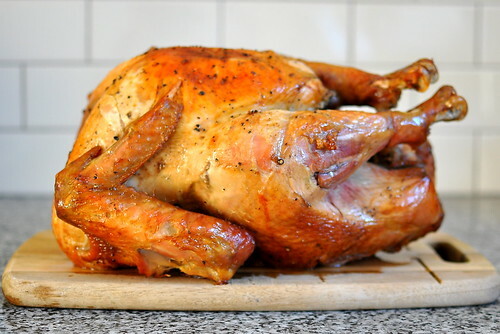 Oh my gosh you roasted a turkey! I’m so impressed! It’s so beautiful and golden too! I admit that I’ve been terrified of all turkey roasting matters too, but maybe I too can master the bird! Wow! What else is on the menu for Thanksgiving?? That’s one sweet looking bird! 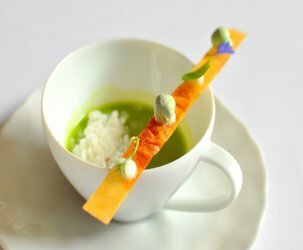 Looks like something out of a cook book. Nice job. I’ll have to save this recipe for a future dinner party. I wanna see what you did with the leftovers! oh man, i’m impressed! 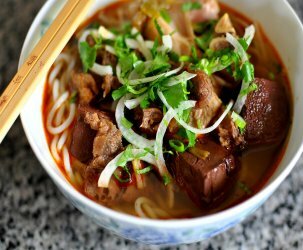 do a fish sauce one next cathy! pretty please?? Bags – That is a brilliant idea! Why didn’t I think of that? Next year. Promise! It looks so perfect! 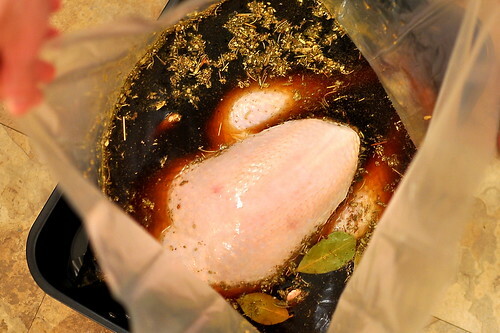 I’ve been wanting to try a brine for awhile… It’s nice to hear some good things about using one! I am all over this right now, Thanksgiving Eve 2012! Used this last Thanksgiving, had to search it out again this year when my Thanksgiving this year was “good.” Want that delicious again for Christmas! Thanks for the sweet note, Mary!